When it is time to get the toughest jobs done, we call on the toughest vehicles. Those job call for trucks. Whether you are hauling materials to and from a job site or driving through the mud in the woods, nothing gets the job done quite like a truck. Two of the most popular trucks on the market are the 2018 Ram 1500 and the 2018 Honda Ridgeline. Which one edges out the other? Read below to find out! 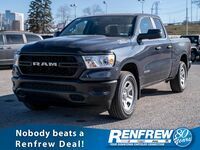 The Ram 1500 is considered one of the most dependable and longest lasting trucks on the market. The Ram 1500 is fully customizable with different cab types, bed lengths, and interior features. Below are some highlights of the 2018 Ram 1500 VS 2018 Honda Ridgeline. 4,830 lbs. Max Trailer Weight 3,500 lbs. 5,710 lbs. Gross Vehicle Weight Rating 6,600 lbs. No matter how you outfit the Ram 1500 it has all the features to get any job done you need! 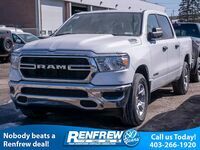 If you have any questions regarding the Ram 1500 or the truck's features, contact our sales team here a Renfrew Chrysler in Calgary! If you are ready to get behind the wheel and experience the raw power for yourself, schedule a test drive online today!